After being diagnosed Jan. 15, 2009, Dad lost his battle with ALS, this past Sunday, Dec. 27th. Although he will be terribly missed, we were all dreading the final progression of the disease. God spared my dad from any suffering. After all his struggles in the last year, God let Dad enter His gates gracefully and peacefully, surrounded by those closest to him. We are all so thankful that he was able to leave his body behind and now is dancing with the angels in heaven. Here's a link to Dad's obituary. Looking back, 2009 has been quite a year for our family. We began the year learning of my dad’s ALS diagnosis. Soon after, we experienced Mike’s dad’s successful treatment of colon cancer. Late July we received Cao Duan Shu's referral! Although I can’t make predictions for 2010, there’s no doubt it will be a roller coaster ride. My dad’s struggle with ALS will continue. ALS has now taken pretty much everything except his right hand. This is a blessing since he still can write and drive his power wheel chair. Unfortunately his right hand is also showing signs of weakness and it is only a matter of time before this goes too. Communication will become very difficult. I cannot predict which month it will happen, but Mike and I cannot wait to bring John “Jack” DuanShu Gentle home! God blessed our family with many joyous memories in 2009. He has met us at every twist and turn. Our experiences have made this Christmas not about the gifts under the tree. Christmas will truly be about delighting in the joy and peace that comes from understanding the first gift, God’s sacrifice, through His son, to give us all eternal life with Him. If you are reading this, please know you are someone very special to our family. Our prayer is that you experience the same joy this holiday season and throughout 2010. Decorating and snacking on candy cottages, followed by watching I want a Dog for Christmas, Charlie Brown...a perfect night before Christmas! Rob and Charlie had their final Christmas performance at FUMC on Sunday. Mike was the voice of a sheep and camel, I narrated, Charlie acted as a dove, and Rob starred as Joseph. Mary was sick so a 6th grader filled in. We weren’t able to take any photos, so you will have to use your own imagination to picture how Mary must have towered over her husband. Unlike last year, the donkey did not steal baby Jesus. Everyone performed very well. Charlie enjoying some pre-Santa crafts. Santa says, "What would you like for Christmas little boy?" Charlie says, "Umm...I can't know!" English translation - I don't know. For Rob, with age comes wisdom. Knowing the truth about pre-Christmas Santa impersonators, this is as enthusiastic about and as close to Santa as Rob would come. Don't worry. Our six-year-old still believes in the real Santa, just not those you see around before Christmas! Grandpa and Grandma Gentle selected a wonderful tree...if you can see it under Rob and Charlie's tinsel job! Here's a summary of Charlie's 4th birthday celebrations. There's now a new member of the Gentle family, he goes by the name of Tom and is a mechanical hamster. Charlie couldn't be more thrilled! As if Uncle Rick and Aunt Debbie needed more bonus points, they definitely scored some with this gift! Here's a summary of the boys' school Christmas performances. Grandma and Grandpa Gentle were gracious enough to sit through two identical performances, one with Rob and one with Charlie. Although I have never actually jumped a hurdle, I cannot help but think Jack’s adoption process has been a lot like participating in a hurdling race. Our latest approval felt like the last big hurdle. Now, it feels like we should be looking for a finish line. Though, yesterday, our finish line sort of disappeared. Our agency said that China’s travel announcements have slowed and they don’t expect ours to come in the 2 to 7 week timeframe. They are not even giving an estimate as to how long it might be. The good news is that I have absolutely no doubt God continues to be faithful. He has led us on this journey and we will meet Jack when His time is right. Our prayers for this adoption have been and will continue to be that God’s will be done. In the mean time, Mike and I now will have more time to work on our Chinese! Rob's prize winning elf cookie. Notice the 3D shoes. Only this picture remains. Rob ate his elf within an hour of creating him. Yes, that would be our pride and joy, Charlie, in the center. Rob's on the left. The kids had sent Santa e-mails through the North Pole website, last Friday. Rob asked for a Nerf gun and Charlie just expressed his frustration that he couldn’t have a monkey. Santa replied telling Rob that he too likes bikes and Charlie that building sets are nice. Rob couldn’t understand how Santa could have gotten his message wrong. Rob thought maybe Santa thought he’d shoot his eye out. (We watched The Christmas Story, Saturday night.) We agreed that Santa wouldn’t really bring a bike because it would be too hard to fit in his bag. Charlie was just excited that he came up with a new gift idea for his birthday and Christmas, yesterday morning. He’s now asking for super powers and a jet pack. This morning, Rob’s Mike Gentle genes were more prevalent than ever. I have absolutely no worries that this child will ever be a procrastinator. Every morning, he dresses himself for the day in his top bunk. After dressing, he always makes his bed before coming down. Immediately after breakfast, he heads straight for the bathroom to brush teeth. He always wants to have his tasks completed so that he has plenty of free time. Today, I think it about killed him that I asked him to wear his sweats until I could take a shower and iron his church clothes. So rather than get up, he patiently waited in his bed for me to take a shower and iron. That way he wouldn’t have to add an extra task to his morning routine! Our i800 approval from the USCIS came on Friday! Praise God! Now, documents from two locations in the U.S. must meet up at the American Consulate in China. Then, with Jack’s visa approval, the U.S. will forward the news on to the China Center of Adoption Affairs. They will then issue a travel date. This process is estimated to take anywhere between 2 and 7 weeks. If all goes well, we could travel in February! Our saga continues with Charlie, Santa, and his birthday. He came up with the idea, Wednesday morning at school, that a monkey would be a lot more exciting than balloons. I’ve told him that Santa doesn’t bring monkeys and that mom and dad might have to go to jail if we had a monkey because the government doesn’t allow it. But Charlie responds saying that he’ll keep him in a cage. Rob’s been telling Charlie that Barack Obama made the monkey rules, so blame him. Mike took this video of Charlie watching the end of The Incredibles. Jack’s Christmas package is being delivered in the next few days. I was going to send the moon cake care package instead, but after reading the description, "These cakes were made with melon seeds, lotus seeds, almonds, minced meats, bean paste, orange peels and lard. A golden yolk from a salted duck egg was placed at the center of each cake, and the golden brown crust was decorated with symbols of the festival," couldn’t do it. It may be a delicacy there, but I couldn’t open myself up enough to embrace this part of the Asian culture. I think our entire family could learn a lesson from the Chinese about not being picky eaters! The kids came out, yesterday sporting one of their funniest costumes I had seen. 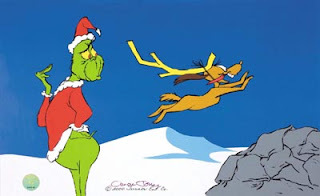 After watching How the Grinch Stole Christmas the previous night, Charlie came out as Max the dog and Rob as the Grinch. They used Tinker Toys and a rubber band to make Max's antler. I hope you had a more comfortable sleep, last night. Rob and Charlie are getting into the Christmas spirit. They were after me from the moment we walked in the door, Sunday night, to get out our nativity set. I don’t think they are angelically acting out the nativity story; I found the set’s camel hanging by its neck from our entertainment center. But it is still fun to see them playing with it. The boys are beginning to practice reciting their one Christmas wish at school. During their school programs, the teacher will hand each student the microphone and have them tell the audience their one wish. Rob’s will be for a Nerf gun. Charlie has decided to ask Santa for balloons. His birthday expectations for Mike and I are impossible (Santa’s sleigh, reign deer, and suit, and flubber) but all he wants from Santa for Christmas is balloons! Hope today’s sunshine makes it into your room.